How does your dentist diagnose gum disease? What are treatment options for curing gum disease? Dental cleaning in San Clemente, Orange County. Healthy gums are pink, firm and don't bleed as easily. Gum disease causes your gums to turn red, puffy and bleed easily. Our gums are every bit as important as our teeth. After all, our gums are what supports our teeth and keeps them in place. This is why properly caring for your gums is very important to your overall oral health. Without properly caring for our gums, you will develop gum disease known as gingivitis and periodontitis. Gum disease can occur in adults at any age and any time. If left untreated, gum disease causes your teeth to become sensitive, loose and eventually leads to tooth loss. In fact, gum disease is the number one cause of tooth loss among the adult population. Advanced peridontitis has been linked to certain heart conditions and serious medical issues. Gingivitis is early stage gum disease restricted to gum tissue. During gingivitis, the infection is still contained and has not spread to your jaw bone as of yet. Signs of gingivitis include bleeding gums, bad breath and generalized tooth sensitivity. In its more advanced stage, gum disease spreads from your teeth and gums into your jaw bone. This causes bone loss, tooth looseness, teeth separation and eventually leads to tooth loss. Furthermore, peridontitis has been linked to certain heart condition and other systemic medical conditions. If left untreated, bacteria spread through the bloodstream and sinuses to the rest of your body, compromising your overall health. Your dentist starts off by examining your X-rays for bone loss, tartar buildup and other visible signs of gum disease. Next, he or she will perform a visual exam to look for areas of redness, inflammation and gum recession. 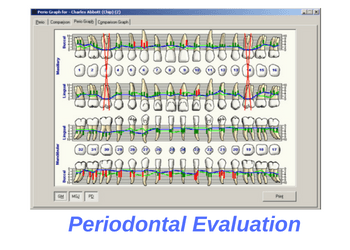 Finally, your dentist will conduct a thorough periodontal gum evaluation. This includes measuring for periodontal pockets, accessing bleeding levels and checking for tooth mobility. Only after completing a full periodontal examination can your dentist determine what stage of gum disease you have. This helps determine the type and frequency of dental cleaning which best suits your needs. If you have healthy teeth and gums, you only require a simple cleaning. If you have gingivitis but not periodontitis, you will require a full mouth debridement. If you have periodontitis, you will require a deep cleaning. In the absence of gum disease, you typically require a regular dental cleaning every 6 months. Regular dental cleanings are relatively simple and are usually completed in a single session. Your regular dental cleaning will usually last about 30 minutes and will conclude with a polish and fluoride application. If you are suffering from ginigivitis without periodontitis, then treatment typically involves a more comprehensive cleaning known as full mouth debridement (FMD). Full mouth debridement involves light scaling of your teeth roots to remove tartar and offending bacteria. Occasionally, we prescribe antibiotics, oral rinses or other adjunct treatment to better eliminate the offending bacteria from your gum tissue. Patients with full mouth debridement typically require a followup dental cleaning every 4 to 6 months. If you suffer from advanced gum disease, known as periodontitis, you will require a deep cleaning. Only a deep cleaning, also known as scaling and root planning, can effectively remove heavy tartar and restore your gum health. A deep cleaning involves rigorous scaling of your teeth along with planning of your teeth roots. The objective of a deep cleaning is to remove all tartar and bacteria from your teeth and root surfaces. Most patients who receive a deep cleaning will require followup dental cleanings every 3 to 4 months afterwards. Waiting 6 months or longer is typically not recommended as there can be additional harm t0o teeth and gums during this period. Performing an effective deep cleaning usually takes quite a bit of time. At our office, we use both a cavitron as well as hand instruments to perform most of our deep cleanings. Additionally, most deep cleaning procedures are completed during two or more sessions. This allows us to focus on cleaning a portion of your mouth each time for best results. Many deep cleaning procedures are performed under anesthesia to minimize discomfort. Finally, it is not uncommon for us to use antibiotics, oral irrigation or laser to achieve a better final outcome. After finishing your deep cleaning we will recommend a follow-up appointment within 3 months. During your follow-up appointment, we will re-access your gums to look for signs of improvement. Depending on how things look, we will determine if your gum disease is under control or if more work is required. If your gum disease has failed to resolve, more advanced treatment will be recommended. This involves treatment such as osseous gum surgery, laser debridement or other complex periodontal treatment options. To learn more about gum disease and dental cleanings, give us a call today. Contact us by calling (949) 481-2540 or schedule your appointment online. During your consultation, we will examine your teeth and gums to determine ir you are suffering from gum disease. Depending on our findings, we will make a recommendation as to the type of dental cleaning that is right for your. Additionally, we will create a customized recall protocol to help keep your gums healthy and happy for many more years to come.